If your teeth have cracks or chips visible on their front surface, porcelain veneers can restore them in a natural-looking and aesthetically pleasing way. 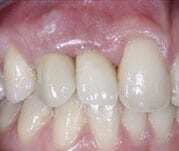 The treatment can fix years of damage and discoloration as well as improve problems with teeth alignment and spacing. As a family dentistry and prosthodontic practice, Dental Restorative Group offers expertise in repairing, replacing, and maintaining the health of teeth. Cambridge and Greater Boston patients commonly refer their friends, family, and colleagues to us because of our gentle, patient-first approach. We also offer weekend office hours and participate in a variety of insurance networks. Learn more about how we can help you improve and protect your smile. Porcelain veneers are thin, tooth-colored shells that cover the front of your teeth to improve their appearance. These shells can alter the shape, size, and color of teeth for a more balanced and aesthetically pleasing smile. Damage. Your teeth may have developed chips, cracks, or craters. Veneers can re-create a smooth surface. Discoloration. Root canal treatment, certain foods and drugs, and behaviors such as smoking can change the color of teeth. Veneers can restore them to their original color. Spacing. 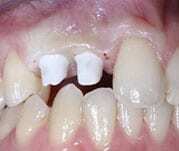 If you have a sizeable gap between teeth, veneers can reduce this space. Wear. Teeth that bear the brunt of chewing can become shorter than neighboring teeth over time. A restorative procedure can return balance to their appearance. Dental crowns can also replace teeth that have been damaged or decayed. However, if the damage is at the front of the tooth—where a porcelain veneer can cover it—veneers may be a better solution. They require significantly less removal of the existing tooth structure. If discoloration is the main problem for a patient, our doctors may first recommend teeth whitening. The whitening treatment is not always successful with teeth that are severely stained or discolored from a root canal. In these cases, veneers can quickly and significantly improvement their appearance. Orthodontics may be able to adjust crooked or misaligned teeth. However, committing to the expense and time involved with orthodontics does not fit every patient’s needs. Porcelain veneers may be able to improve alignment in much less time. Schedule an appointment with our Cambridge, Belmont, or Arlington offices to discuss porcelain veneers. During your visit, your doctor will talk with you about the concerns you have. The doctor will conduct a thorough examination to evaluate your needs and the health of your teeth, and, by the conclusion of the visit, provide a full treatment plan. Porcelain veneers are an excellent option for the right patient. However, they do require removing a portion of the front of your natural teeth to make room for each veneer. As a result, your doctor may first recommend other treatments. As a patient receiving porcelain veneers, you can expect that the materials Dental Restorative Group uses will be well-researched and proven. Our doctors extensively review quality and efficacy to determine the best materials and affordable alternatives. Basing our practices on research allows us to provide effective treatment to all of our Cambridge, Belmont, and Arlington patients. Your doctor will prepare the teeth that are receiving veneers by removing a very small amount of enamel from their front surfaces. The doctor may use a local anesthetic to make you more comfortable during the procedure. Dental Restorative Group will take an impression of the teeth to fabricate your veneers. Unlike many other practices, we complete fabrication very quickly thanks to an on-site facility and partnership with one of the field’s most renowned dental technicians. The result is that our dental team can produce veneers with a high level of precision, speed, and quality. When the porcelain veneers are ready, your doctor will test their look and fit, make adjustments as necessary, and place them using dental cement that activates with a special light beam. It may take some time before the veneers feel like a natural part of your teeth. During checkups, your doctor can make adjustments to improve any concerns you have. Porcelain veneers require no special care beyond proper oral hygiene and typically last about 5-10 years, after which time you can have them replaced in a brief follow-up procedure. If you have discoloration, damage, or other aesthetic concerns related to your teeth, you may be a good candidate for porcelain veneers. Schedule an appointment in Cambridge, Belmont, or Arlington with Dental Restorative Group.